Are you selling your car soon? Do you want it to look professionally clean but don’t have the budget for it? Were you to outsource it (and you certainly could), look to spend $100 – $300 or more for a standard auto detailing, according to CostHelper.com. Consider detailing the car yourself. You can do it. I’m going to show you how. The summer after my high school graduation, I got a job as a car detailer’s apprentice. Cool title. No dancing broomsticks. To this day, this was still one of my favorite job experiences. What I learned was a long list of simple and effective cleaning tips. Combined, they turned grimy cars into masterpieces. More importantly, the owner, Vicki, worked directly with me on each car. Ten years later, I can still remember what I learned. There are probably hundreds of steps people could take to detail their cars. I’m giving you 15. Things like “wash and wax your car” didn’t make the list. We’re going for the details. 1. Vacuum – air hose – vacuum – This is the most powerful, deep cleaning combo in the whole arsenal. 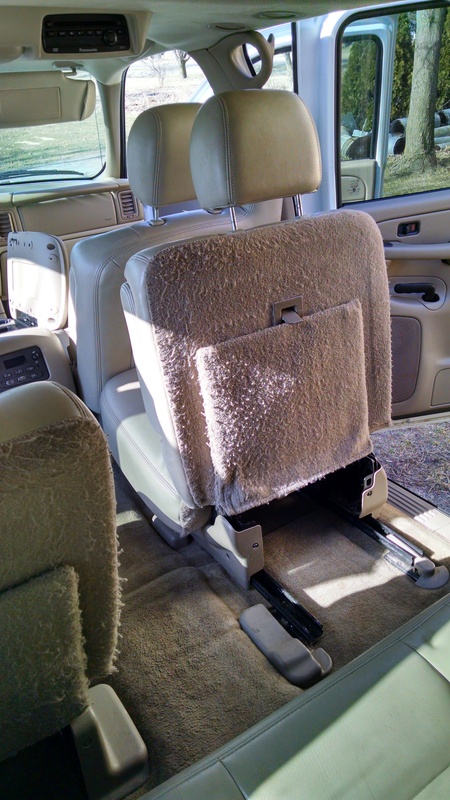 Empty your car and pull out the floor mats. Vacuum every surface. Move seats around. Then use an air hose (it’s like a pressure washer but with air) and spray every small surface, edge, crease, vent, console, etc. You’ll be amazed how much dirt this brings out. Vacuum thoroughly one more time. BONUS TIP: Swing open each door and use the air hose to blast dead leaves and twigs from your door jams. 2. 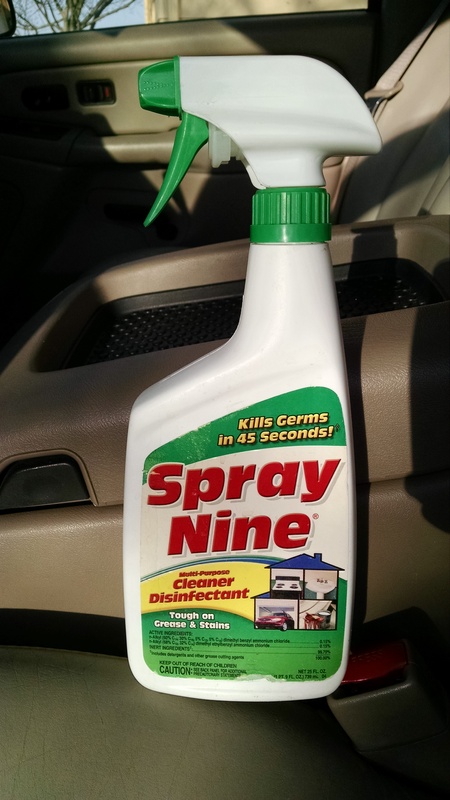 Spray Nine – Your second most powerful, deep cleaning tool is my good friend Spray Nine . This stuff is strong. It works almost like acid to cut through deep stains and grime. Spray directly on carpet stains then scrub with a brush and water. WEAR GLOVES – and a mask if you’re not in a ventilated area. 3. Scrub the ceiling – Take a minute and look up. See any dirt? Wipe it down with Spray Nine and a rag. 4. 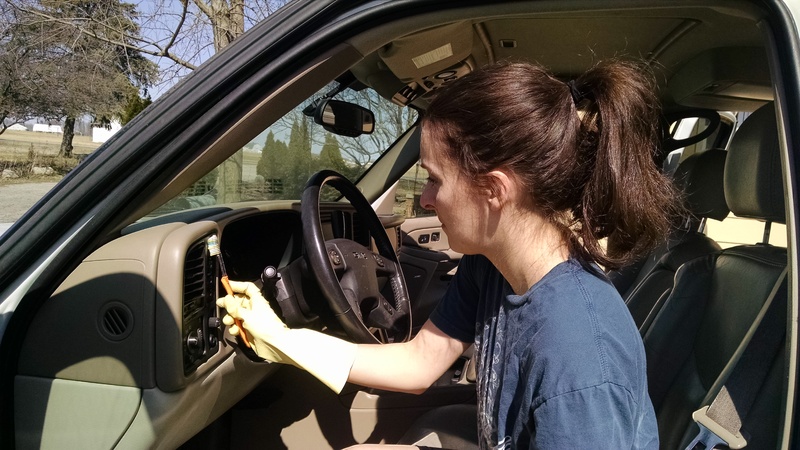 Detailed wipe down of dash and console – Use Spray Nine to clean the dash, console, door panels, cup holders, etc. WARNING: Spray Nine will remove the white symbols on your paneling – i.e. 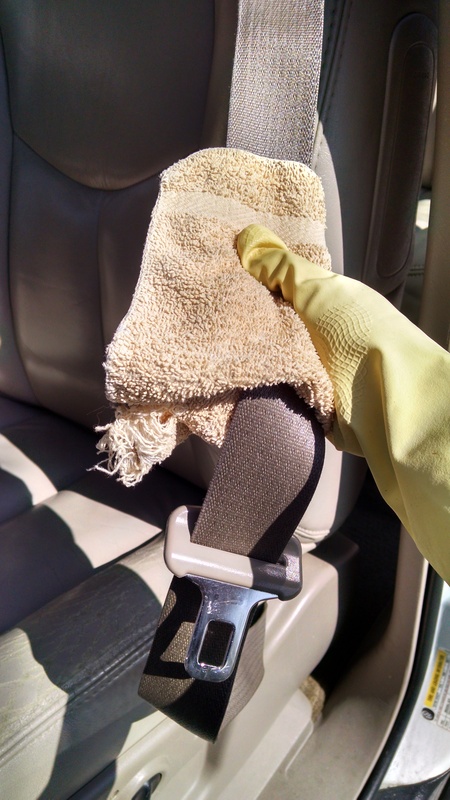 turn signal, door lock – so do a quick wipe with a damp cloth, toothbrush or Q-tip. 5. Diluted Spray Nine on leather – Never spray solution directly on leather, unless you want it to look plagued. Apply solution to a damp cloth, wipe leather, then dry immediately with a clean towel. 6. 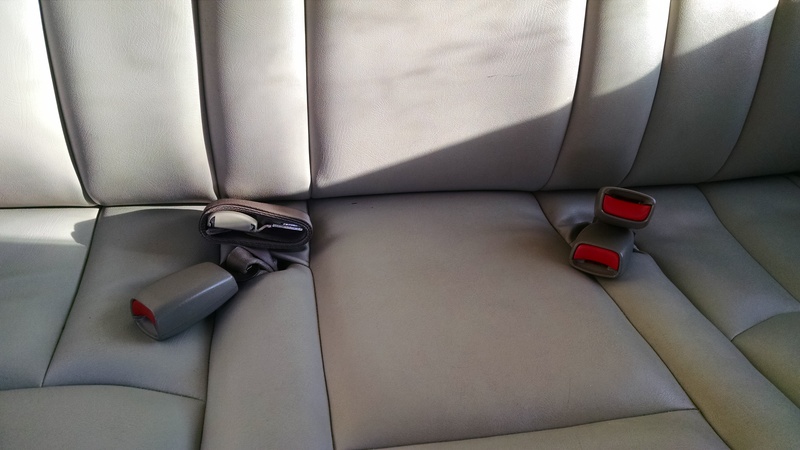 Scrub seat belts – Pull seat belts out as far as you can. Apply Spray Nine. Use a scrub brush and water. Scrub hard, front and back. Those things get filthy. Wipe with a towel. 7. Pressure wash floor mats – Set floor mats in driveway and scrub with Spray Nine and water. For best cleaning, use a pressure washer. If one is not available, use a hose. WARNING: Leave floor mats out until they are 100% dry. If you put them back in the car while damp, it will create a musty smell. 8. Use interior protectant on dash, console, door panels, floor boards, cup holders. This gives a professional look to the car. Use Q-tips for vents and tight edges. Apply to weather strips to add extra POP. WARNING: Do no apply protectant to the outer rim of the steering wheel or the gas and brake pedals. These surfaces cannot be slippery while driving! 9. Crack windows and lift wipers – By cracking the windows, you can wipe the dirt line at the top, then roll them up and clean the rest. 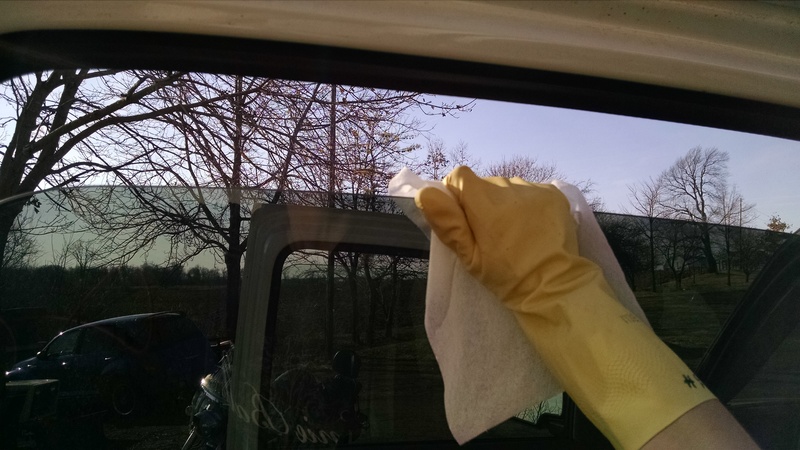 By lifting the wipers, you can clean the dirt line on them as well. 10. 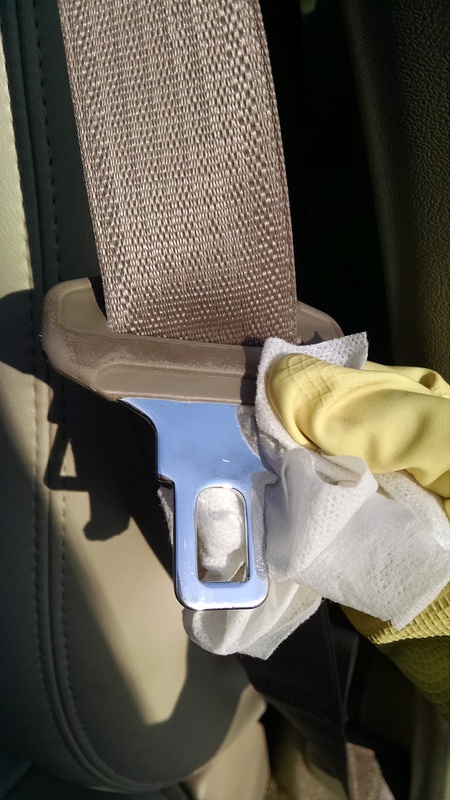 Use glass cleaner at the end to shine your metal seat buckles. Don’t forget mirrors and your sun/moon roof. Again, this adds that extra “finished” look to your car. 11. Pull buckle on lap belt out to the end and roll it up like a tight scroll. Tuck it into place for a cleaner look. 12. Pop your hood and spray the engine with degreaser. Wash it off with hose. Make sure your engine is not hot! 13. 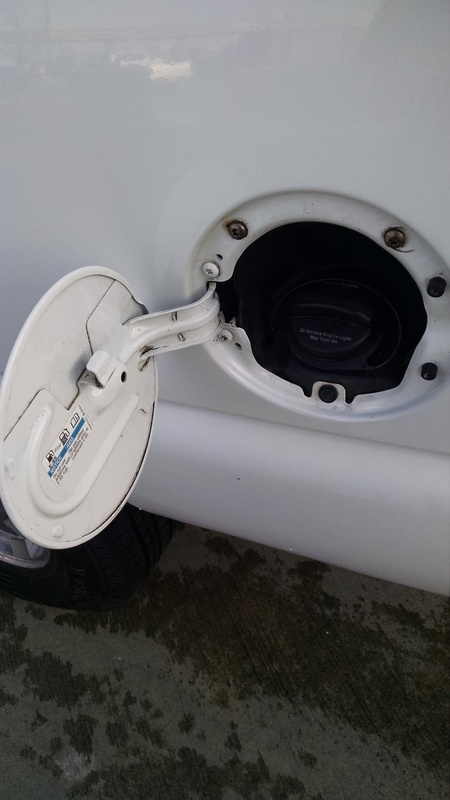 Open gas tank lid and spray with degreaser. Also open all car doors as wide as possible and spray degreaser into hinges. Use a hose to wash hinges and gas tank. Wipe clean with towel. 14. Dampen your tires, apply degreaser, scrub with a brush and water, then wash off with a hose. Once they’re dry, add protectant and wipe with a cloth to make tires shine. 15. Wash and wax your car – IN THE SHADE. Towel dry. This will help prevent streaks. Like I said, I’m no pro at this, so you don’t have to be either. I’m just looking for one more way that you can accomplish your goals while saving money. Join the Discussion: Have you tried any other detailing steps that make your car really shine? Ha! I can tell by the interior shots that you drive a vehicle nearly identical to mine! Funny 🙂 We always detail our cars ourselves. Good for saving on resale value too without having to spend several hundred to get it done. Great post, Laura! Thank you, Laurie. Way to be frugal AND to keep up with detailing your cars. It’s the upkeep I’m terrible at. Thanks for your informative! 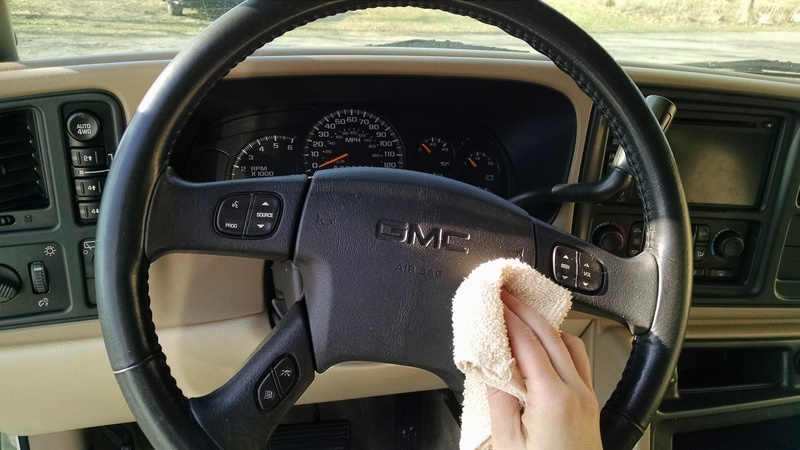 These tips will help me/us to keep car nice and clean, and would be able to sell it at a reasonable price. Keep up the good work! So glad to help out, Andy! Wow, I have never even thought to do some of the tasks you have outlined here: (ceiling, gas cap). Although getting done with cleaning my car can seem endless the tips you suggested with the ‘nine spray’ will be a great time saver in the future. I have been looking at ways to preserve our newly purchased vehicle and your tips are really good. Thank you for sharing this post. Air hose! Does a great job. Thanks for pointing out that you must vacuum every surface of your car to make sure that you’ll be able to deep clean everything in it. with that in mind, I’ll make sure to include car vacuum to my to-buy list because I’m interested in shopping for auto detailing supplies. My plan is to have 3 of our cars auto detailed. What I want is to make them as clean as possible, so I will consider all your tips.